No one wants to deal with a cold or the flu in the middle of winter. Viruses throw up a big blockade throwing us off of our normal routine. However, as more and more strains of the flu and various germs continue to be on the rise, it may be inevitable. Still, as the dentist Brookline residents go to for our preventative dentistry and oral health needs, trust us when we say a clean mouth is a happy mouth. Germs are spread through our mouths, eyes and nose. So, what better way to stay healthy then by paying close attention to your oral health? Many types of flu strains exist. Viruses like the common cold and flu are contagious spreading through coughs, saliva, and sneezes. Influenza is prevalent during the colder months. Typical flu season is from October to March, yet can go well into May. The flu virus lives on hard surfaces for nearly 48 hours. It can survive on clothing for up to twelve hours. If you are caring for someone who has a virus, wash your hands often as well as all surfaces. Clean your hands regularly as you do laundry, as well. 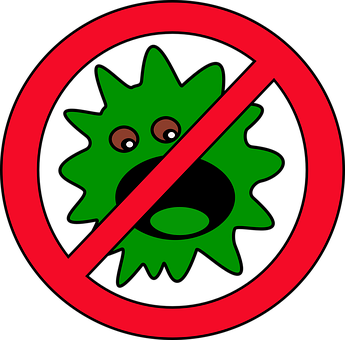 Use disinfectant wipes to remove germs from remotes, phones, computers, door handles, and light switches. The more you can rid the germs in your house, the less likely you’ll contract the virus. Our Brookline dentist encourages a healthy hygiene routine at all times. Brushing and flossing may be the last thing you want to do when you are sick, but you’ll be surprised at how quickly a clean mouth will make you feel better. Brushing and flossing removes bacteria from your gums and teeth. Cleaning these germs from your mouth prevents infection from setting in. Your oral health needs your attention every day of your life. A healthy hygiene routine will help prevent a virus from taking over. One more way you can keep yourself and your mouth healthy is by changing your toothbrush. The ADA and our Brookline dentist recommend a new toothbrush every 3 or 4 months. Germs can live on your brush handles and in the area you store the toothbrush. Clean these areas often and don’t let your brush touch other toothbrushes. Talk with us at your next appointment about ways to sanitize toothbrushes if you have questions, and learn why a clean toothbrush is good for your smile. If you take preventative measures against the cold and flu season, you’ll greatly reduce your risk of getting sick. Taking care of your hygiene and oral health needs is important as well. Eat healthy foods and drink plenty of water so you can help your body stay strong while fighting off the germs. Our Facebook page has more healthy tips regarding your oral health and our services. Let’s work together to keep our smiles and bodies healthy this year.